My husband and I love macaroni and cheese. And I mean we truly love it. Our boys don’t really seem to be fans of this classic staple so we don’t have it very often which is probably for the best. The upside of this is that we get to jazz it up a bit when we do make this hearty dinner. I am a big fan of Buffalo Chicken and when we visited NYC for our anniversary a few years ago, we ate at a Mac&Cheese restaurant called S’Mac. 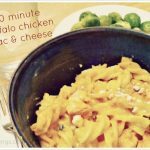 I had the buffalo chicken mac & cheese and have been recreating it ever since! The recipe is based on my mom’s classic from my childhood. There is so much comfort in this food I don’t even know what else to say other than DIG IN! Wait until you try this Buffalo Chicken Mac and Cheese Recipe. It is great for feeding a crowd too! While water is heating, prepare the cheese sauce by combining the milk, flour, butter, cheese, and salt in a microwave safe bowl. Microwave on high for 4 minutes. Stir sauce and microwave on high for another 4 minutes. Cook chicken in a small amount of olive oil or butter until cooked through. Add 1/4 cup of buffalo sauce and remove from heat. Once pasta is done, stir in the cheese sauce and buffalo chicken. Top with Bleu cheese crumbles (if desired) and enjoy! Do like to add things to your Mac & Cheese or do you stick with the classic? This isn’t the only thing I’ve written about cheese. Check out more of my cheese adventures! Yum, yum!! This is going to become a staple in my house, I can already tell!! Holy all the things I love!! Right!? It’s ridiculously good and easy. This looks delicious! I am going to have to try to make this on my next cheat day! OMG these are two of my favorite foods! I never thought to mix them together to make Buffalo chicken mac n cheese. Saved the recipe, I will be trying this asap. That’s what it was like when we ate at that restaurant in NYC! Mind BLOWN. My hubby would like to know if you will marry him and make this every night? I think my hubby might have something to say about that! Something tells me you could take this and make it 1million times better! There’s a MAC&CHEESE restaurant in NYC? I’m so there. 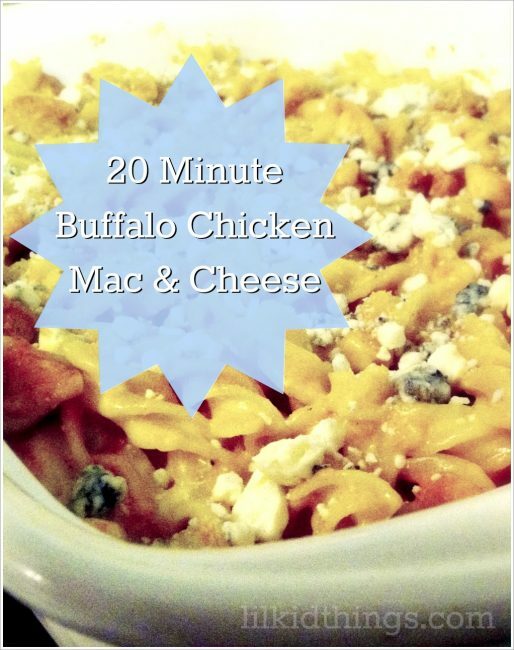 I have never used buffalo sauce in Mac & Cheese but this sounds DELICIOUS!!! OMG! Yes and yes. In my mouth. Please.